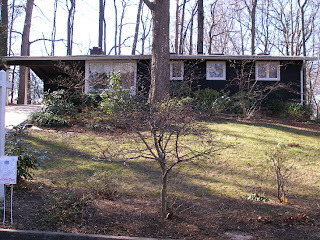 1956 MCM in Holmes Run Acres – $579K; Open 2/4 from 1-4 p.m.
Here’s a listing for a 3 bedroom/2 bath two-level in Holmes Run Acres in Falls Church. The home features walls of windows and vaulted wood beam ceilings. Sellers are holding an open house Feb. 4 from 1-4 p.m. if you want to take a peek.